Graham Sullivan lifted by Russel Burges (L) and Kevin Palavi-Fiu. SATURDAY was a big day for ARKS as the club finally returned to the Premier Grade competition after 15 years in the district competition. The round 1 games were held at home to UWA and, although ARKS lost all the games, the standard of the games and the tight score lines in the first and thirds showed that the teams were competitive. The new look ARKS side retained four players from last year’s A Grade side, with the majority recruited following the elevation to Premier Grade. ARKS also has new coach Paul King cracking the whip to get the players moulded into a team. 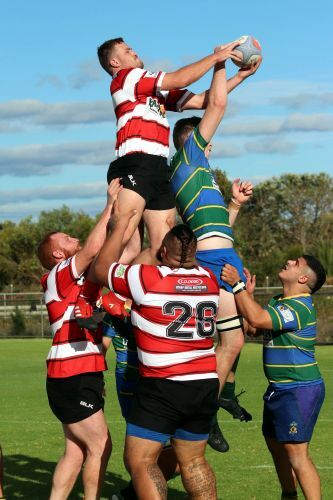 UWA thought ARKS would not offer much resistance as a new team, but found ARKS an effective unit and certainly up to the standard expected of Premier Grade rugby in its 15-7 win. The game started with UWA pressing hard in ARKS’s 22 and ARKS had trouble getting out of the danger zone. Eventually it found some rhythm and started applying pressure back on UWA, but the ARKS players again found the release at the tackle difficult to apply and tackle penalties ended many phases, giving UWA control. The tight game continued through the first half with UWA unable to score even with the majority of possession. UWA had good opportunities to score but ARKS managed to maintain enough tackle pressure to cause handling errors and, with a scrum equal to the UWA outfit, were able to hold the ball in set-pieces . Losing Hamish Buick to injury in the half was a setback with others having to fill-in for the top No. 10. The half-time score was nil-all and it was not until the last quarter of the match that UWA finally scored with an unconverted try. Five minutes later a good move saw a second try under the posts which was converted. ARKS was not finished though and 10 minutes later a break from the half-back saw a quick passing movement and ARKS scored beside the post from 30m out and a quick drop kick conversion taken to try to get the game rolling again. In last few minutes ARKS put everything into attack but a final penalty for not releasing at the tackle in front of the posts allowed UWA to put the game out of reach. The final score was ARKS 7 to UWA 15, with a high penalty count due to indiscretions at the tackle being a major factor in the result. The ARKS Man of the Match was Ryan Black. This week’s reserves team was made up of first team reserve players and thirds players running on for a second game. The team had not trained together before this game, however the effort and commitment the players showed bodes well for the future when the missing bodies return. From the start it was evident the UWA team were a well practiced unit and their pressure on the ball in loose play created turnovers from ARKS. ARKS was not able to score any tries but went close a couple of times. UWA running out big winners, the final scores ARKS 3 to UWA 40. ARKS Man of the match was Keith McAllister. ARKS fielded a side that was composed of mainly 2017 B Grade players looking forward to the new challenge this year. The opening quarter was very even with both sides trying to play attacking rugby. It was not until the 20 minute mark that UWA was able to penetrate the ARKS defence with a good backline move that saw an unconverted try scored. Fifteen minutes later ARKS evened up the score and, just before halftime, went ahead with a converted try to lead 12-5 at the break. The second half saw the even contest continue until an ARKS player received a yellow card. During the next 10 minutes UWA managed to score two converted tries. The last quarter was again very even with both sides score converted tries to leave the score at ARKS 19 to UWA 26. Man of the match for ARKS was Karlos Amalfitano.